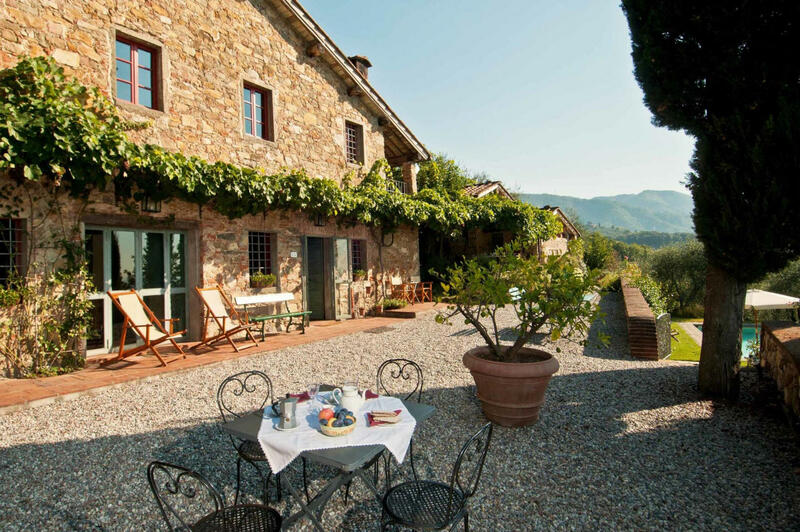 Montevigna is a beautiful stone building (320 sq m) with WiFi internet and private pool. The property can accommodate up to eight people comfortably in four bedrooms with four bathrooms. Conveniently located 14 km (9 mi) from Lucca, Italy in the tourist area "Lucca And Surroundings" and only 33 km (20 mi) from Pisa. There is a golf course nearby if you'd like to get in a round or two while on holiday. In nearby towns there are local shops where you can find fresh produce and other items. If you can't find what you need locally, there is a shopping center located 7 km (4 mi) from the property where you can purchase your food and personal items. The stone-built property is located above the village of Marlia, famous for the historical villas of Lucca and their magnificent parks. 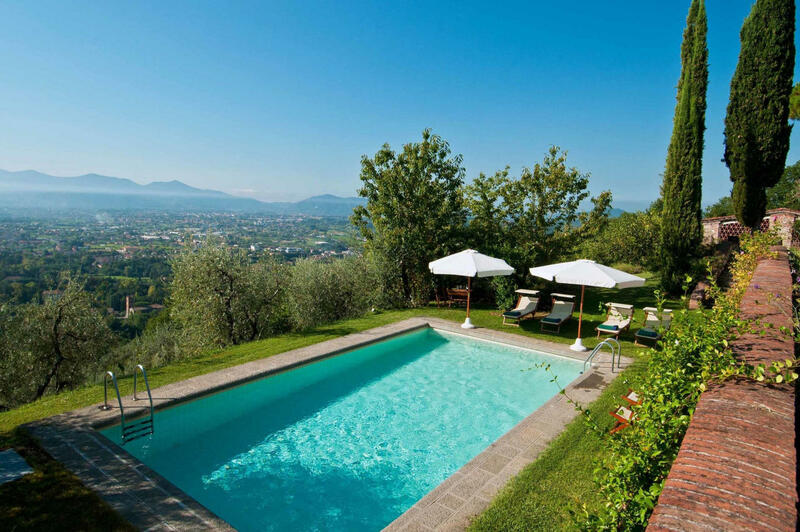 This makes the views from the garden and swimming pool spectacular, since scattered in the surrounding countryside, with its olive groves, it is possible to see Villa Grabau and Villa Reale, where Elisa Bonaparte Baciocchi, Napoleon’s sister and Princess of Lucca, resided. After arriving you will be welcomed by the owner or manager where you’ll find a nice clean well-maintained property with views of the hills and the city perfect for a peaceful vacation in Tuscany. For your pleasure you will find a private pool where you can unwind while enjoying a nice cold beverage after a hectic day of sightseeing. It's really convenient to have a washing machine on the premises that is available for your laundry needs. Sharing a meal with friends and family is a big part of the Tuscan culture. Take advantage of the well-equipped kitchen to prepare meals using local produce while on your vacation. The kitchen includes coffee machine, microwave, toaster, stove and refrigerator, as well as, plenty of tableware and cutlery for up to eight people. Dine 'al fresco' like a real Tuscan, the fully furnished balcony is the ideal setting to enjoy food, family and the nice Tuscan weather. Most people enjoy visiting close-by cities and towns while on vacation, so for your reference this is a list of popular places with driving distances from the property: Pisa 33 km (20 mi), Viareggio 40 km (25 mi), Forte Dei Marmi 47 km (29 mi), Florence 77 km (48 mi) and La Spezia 86 km (54 mi). The highway is only 10 km (6 mi) from the villa and there is a train station 2 km (1 mi) away. Some other major tourist destinations you should consider visiting are: Florence 77 km (48 mi), Viareggio 40 km (25 mi), Forte Dei Marmi 47 km (29 mi), Rome 354 km (220 mi), Venice 312 km (194 mi) and Milan 289 km (180 mi). Nearest Airports: Pisa (Psa) 47 km (29 mi), Firenze Peretola (Flr) 76 km (47 mi), Bologna (Blq) 157 km (98 mi), Milano (Lin) 287 km (178 mi) and Venezia (Vce) 315 km (195 mi). Cleaning service included 3 hours a day 5 days a week. Including: kitchen, living room, bathroom, generic room, service room. Kitchen: well equipped kitchen, dining table (people: 8), dishwasher, fridge, freezer, microwave, stove top, oven, toaster, italian coffee machine, american coffee machine, fireplace, WIFI internet, exit to the garden. Living room: two sofas (people: 6), working desk, fireplace, WIFI internet, exit to the garden, exit to the terrace. Including: living room, bedroom + ensuite bathroom, 2 bedrooms, bathroom. Living room: sofa (people: 3), three armchairs, fireplace, WIFI internet, satellite tv, television, portable fan, vcr / dvd, exit to the garden. Bedroom + Ensuite Bathroom: two single beds, WIFI internet, portable fan, basin, toilet, bidet, bathtub, shower, hairdryer. Bedroom 1: two single beds, WIFI internet, portable fan. Kitchen + living room: stove top, sofa. Bedroom + Ensuite Bathroom: double bed, WIFI internet, portable fan, basin, toilet, bidet, shower, hairdryer. Garden: swimming pool (length: 10m, max. depth: 1.8m, min. depth: 1.2m, width: 5m, fenced), barbecue, al fresco dining, dining table (people: 8), terrace furniture, four sunbeds.